Burden: Am I allowed to say that man's a racist? Wexford: Why, you're allowed to say it to me. Burden: I thought it was against the law. Wexford: It's against the law to incite racial hatred. It is not against the law to be an overprotective parent. Ruth Rendell, the revered British mystery author, has written countless whodunits over the past four decades, concocting a unique formula that combines intricate plotting with biting social criticism. Many of her novels require the stalwart yet sympathetic Chief Inspector Reginald Wexford to untangle the twisted alibis and crooked motivations of her gallery of suspects, and Simisola is no exception. Thought-provoking and appropriately unsettling, this television adaptation comes to DVD bursting with English flavor, although its story leaves a bitter aftertaste. Rendell exposes a disturbing undercurrent of racism in Britain, which she explores through the disappearance of Melanie Akande (Grace Mattaka), a young black woman who vanishes after an interview at an employment agency. Akande's father (George Harris), a noted physician, just happens to be treating Inspector Wexford (George Baker) for a nagging virus, and enlists him to delve deeper into the case. The investigation yields two murder victims and a host of unsavory characters all harboring the prerequisite dirty secrets. Wexford soon realizes his virus is small potatoes compared to the more insidious malaise afflicting all of England with regard to its prejudicial racial attitude. Alan Plater's screenplay takes the long road, dutifully following Wexford and his assistant (Christopher Ravenscroft) as they encounter new leads and crash into dead ends. The meandering approach deftly shows how tenuous threads must be spun together to solve complex cases, but at the same time bogs down the film in procedural episodes that lack dramatic impact. Strict viewer attention is mandatory to follow the story, but the script (and direction by Jim Goddard) tests patience with its dry, clinical style. Performances possess a decidedly British flair, with Baker and Ravenscroft keeping stiff upper lips most of the time. Accents, however, tend to run a bit thick, making dialogue difficult to decipher, especially when lower class characters are speaking. Still, Rendell's powerful message is broadcast loud and clear, almost compensating for any production deficiencies. And what/who is Simisola? Well, that's just one of the mysteries in Rendell's bag of tricks—and you'll have to watch the movie to find the answer. 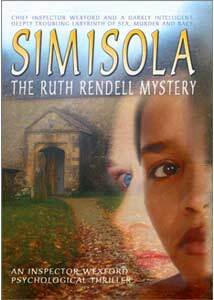 Image Transfer Review: Simisola: The Ruth Rendell Mystery is a made-for-television movie, and the full screen DVD transfer exposes all the flaws that regular TV masks. Video is overly grainy, with colors often too pale, although the transfer nicely renders the ruddy English complexions. Depth is sorely lacking, lending the image a flatness that fits the subject matter (and the dreary English weather), but fails to engage the viewer. Simisola is certainly watchable, but a few enhancements would have better disguised its television roots. Audio Transfer Review: Here the issue of depth rears its ugly head again, with no perceivable presence on the DD 2.0 track. While levels remain solid, all sound seems anchored in the center channel, giving the track a distinct mono feel. Simisola doesn't warrant upgraded audio, but a crisper transfer might have made the actors' dialect-ridden dialogue easier to comprehend. Extras Review: A few trailers for other made-for-TV movies, as well as succinct cast biographies and a blurb about Ruth Rendell are the only extras offered. The box advertises production notes, but none could be found. Simisola possesses far more substance than most mysteries, thanks to Rendell's fierce social conscience. Fans of the genre will appreciate the tangled plot and intriguing cast of characters, who keep the audience guessing until the film's final scene. Mystery buffs will find it a worthwhile rental.